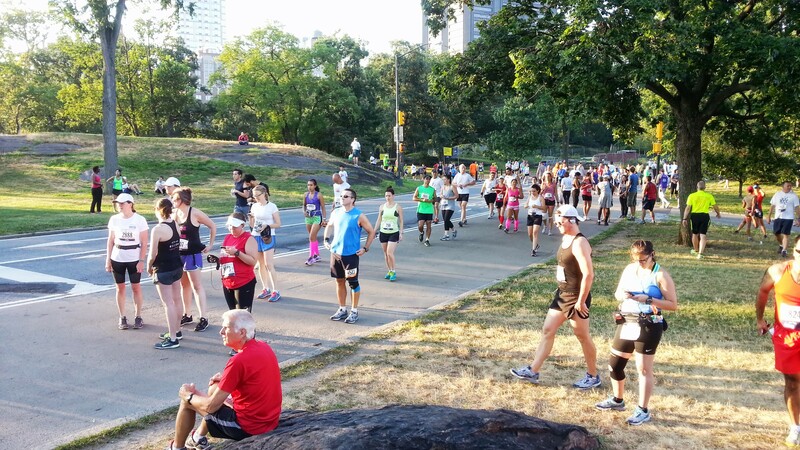 The New York Road Runners have a long training run* each July and another each August. I generally do the one in August, because it’s closer to my goal race, but this year my goal race is a lot earlier so I headed off to Central Park last weekend for LTR #1. I do not run in Central Park very often. I go there for random races and whenever I need a change of pace from my regular routes. When I do run there, I almost never run the entire six-mile loop. I generally only run the lower loops or around the reservoir. Something you might not realize if you don’t live and run in NYC is that the entire city is pretty hilly. Central Park, in my opinion, is very hilly. There are few flat places to run in the whole park and if you do a succession of road loops, you will encounter constant rolling hills. This training season I haven’t run hills very much (to my detriment), but I didn’t have that in mind when I committed to the full 20 miles of the LTR + 2.5 more. During the run, I thoroughly enjoyed myself. I ran with a couple of friends and ran with some runners I didn’t know, but who turned out to be good company for a loop or so. Around mile 13-14 my right hip started hurting. It wasn’t an acute pain, it sort of felt like someone was poking me. Since it was more annoying than anything, and since it wasn’t causing me to alter my gait or slow down, I continued to run. Only as I approached the 20-mile mark did I start thinking I might have overdone it. At that point I actually did have pain in my hip and my right leg just didn’t want to go anymore. One problem: I was a full 2.5 miles away from the subway that I planned to take home. I finished that last 2.5 using a combination of run/walk/shuffle and got home in one piece. I did the usual RICE (and ibuprofen), had a couple of beers, and went to bed. I felt pretty sore, but better on Sunday; I felt even better on Monday, so I decided to try to run. Nope. Not happening. I was scheduled to do a fast four; I finished a slow run/walk of three miles. That was when I decided I had probably actually hurt myself, but I was confused by what the injury might be. I was able to determine that my tensor fascia lata was quite swollen. But my hip had full range of motion and it was not painful to do any of the PT/strength training exercises that I typically do. It only hurt to run and at that point, to walk. I spent the next few days stretching, foam rolling, taking ibuprofen, and putting heat on my hip. I continued to do the exercises that didn’t hurt. I skipped all of my other week day runs. Fast forward to yesterday. I was scheduled for a short long run of 10 miles. It was the day of the NYRR Team Championships. It was also the first Summer Streets day. I loooove me some Summer Streets and I wanted to cheer on my PPTC teammates, even if I wasn’t running the race, so I decided to attempt the 10 miles. I got off the subway and walked/ran two miles to the park to meet up with the team and cheer on everyone running. That little jaunt felt okay–not 100%, but okay. I cheered for an hour or so, hung out with some running friends, then headed back to Brooklyn via Park Avenue. Throughout the run I alternated walking and running various distances, but mostly running. Around mile four, my hip began to feel remarkably stable and comfortable for the first time in a week. I actually had less pain during that run than I had in all the days prior. I ended up with 10.25 slow miles and felt like a million bucks at the end. After the run, through today, my hip feels totally normal. It feels so normal that I can’t believe I was in so much pain. Even the swelling is gone. This is further proof that sometimes running is the cure for running. This isn’t the first time something like this has happened, although this is the first time I’ve worried that I had an actual serious overuse injury. I have a 50k race in six days. I plan to do all my week day runs leading up to it…fingers crossed. * The long training runs (LTRs) are supported runs, particularly organized for people running fall marathons. It’s basically like running a race with no timing. You get a bib and there are aid stations/bathrooms throughout the course. You can run as far as you like, up to 20 miles, and there are pace groups for times up to 11:00 per mile. Summer Runnin’, Having a Blast?